A hunt for nuisance coyotes sponsored by a Roswell, New Mexico, gun shop in which the winning team receives free AR-15s is prompting calls for legislation to ban the practice. Larry’s Gun Shop’s annual Great Coyote Hunt event, now in its third year, is set to run Nov. 15-16 in the Roswell area. Two-person teams pay a $300 entry fee and the sportsmen with the most desert dogs to show at the end of the weekend pick up a pair of new rifles from the shop. Those placing 2nd through 5th place walk away with Larry’s gift cards. The contest adheres to New Mexico state wildlife regulations, but that doesn’t impress local anti-hunting activists who want the practice halted. These events have drawn lots of unwanted attention in the Land of Enchantment, with one, sponsored by a different gun store last year, receiving death threats in addition to nearly 29,000 people signing an online petition opposing the contest. This has led to the possible reintroduction of legislation to ban contests to hunt the animals in which a prize is offered, with violations classified as a misdemeanor for those either sponsoring or participating. One such measure, sponsored by Rep. Nate Cote (D) in 2013, died by a 38-30 vote last February in the state House. Had eight Democratic lawmakers not crossed the aisle to join the opposition, Larry’s hunt this year may have been banned. However, representatives from Larry’s contend that the anti-hunting group is playing up the issue. “(It’s) not inhumane at all. These are a nuisance,” said Colby Griffin, a manager with the gun shop. The New Mexico Department of Game and Fish classifies coyotes as non-protected and allows them to be legally hunted and trapped without restrictions by residents year-round. However, earlier this year the agency prohibited coyote contests on land controlled by the state, therefore pushing future events to federal and private lands. According to the New Mexico Cattle Growers’ Association, predators in the state have killed as many as 9,200 sheep and lamb as recently as 2009. 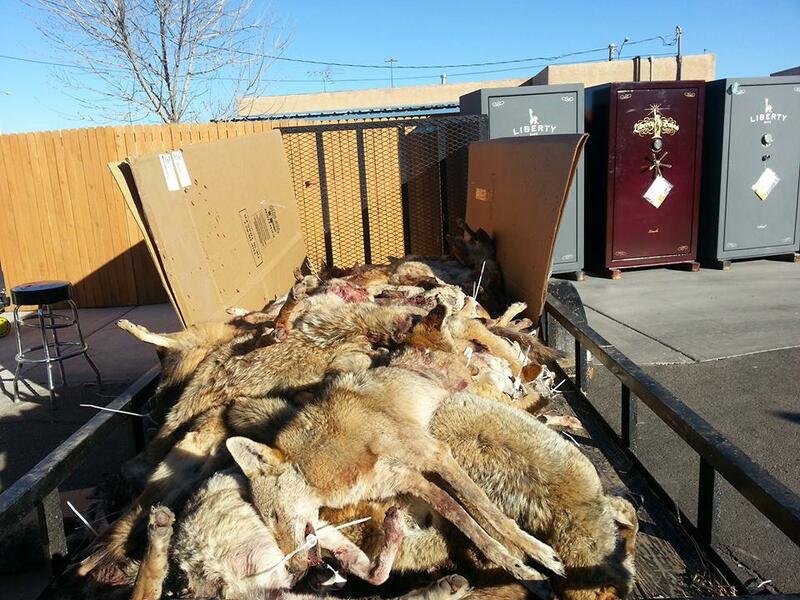 New Mexico is not the only Western state that regularly holds coyote hunts that focus on quantity. In the Red Desert around Rawlins, Wyoming, the National Coyote Calling Contest, with a $200 entry fee per two-hunter teams, has been held for the past several years. This fall’s event, held last weekend, harvested 167 animals with some of the highest averages running as much as 10 dogs per hunter. Similar events are held in Kansas and Arizona. As far as Larry’s is concerned, they are expanding their contest. Besides the established Roswell event, they are starting a new coyote hunt in the Hobbs area next February.